Did SNP R-M222 Spread from County Mayo? Spencer Wells, Director of the Genographic Project (GENO 2.0) sponsored by National Geographic, is scheduled to travel to County Mayo this weekend to announce that it appears SNP R-M222 may have originated there. This gene is associated with Scots Irish descent. Dr.Wells is also expected to identify more that 20 more recent SNPs that branch the gene flows below R-M222. These findings should be of great assistance to Scots Irish researchers by helping them narrow the focus in their search for their ancestral homelands. So we seem to have made it into a batch that started processing on Wednesday. IF all goes well, I should have my results available to contemplate as I watch the ball drop on New Years Eve. It would be unusual if a project as "big" as BIG Y actually came off without a hitch and on schedule. However, miracles do happen. As some of you have heard me say, I was born in Missouri, the "Show-Me" state, and l an a slow learner. Therefore I believe most things two weeks after I see them. So the first batch may or may not come back on time. I'm not sure how often batches will be started. That depends on how many orders are received. So the second batch of BIG Y tests may be a decent interval behind the first. With Y STRs my Dowell DNA project has been able to reconstruct the exact 111 marker results of my 6th great-grandfather Philip Dowell who died in 1733 in Southern Maryland. Where was he or his ancestors before he showed up as an established tobacco planter in the 1690s and where did he get all his "guY DNA?" My voyage of discovery takes on a new leg -- surfing the BIG-Y. We plan to release the first set of BIG Y results in February 2014. Does anyone want to start a pool to predict the date I'll actually get my results? The International Society of Genetic Genealogists (ISOOG) is a totally voluntary organization that does not charge dues. However, since 2006 it has been responsible for maintaining the Y-DNA Haplogroup Tree 2013 for researchers and testing labs around the world. The number of SNPs being discovered has been exploding since the end of 2010 and this is just the beginning. The recent wave of newly discovered SNPs have resulted from the Walk the Y, GENO 2.0 and 1,000 Genomes projects as well as the normal discovery processes of investigation by academics and citizen scientists. The tsunami has yet to come. Geno 2.0 has not yet published all its SNPs. Treasure troves of additional SNPs from FullGenomes and FTDNA’s Big Y tests loom just over the horizon. These have the potential to identify and place thousands of here-to-fore unknown SNPs. Many of these will be leaves toward the ends of branches on the Y-DNA Haplogroup Tree. They will be recent enough to connect with the documented trees by genealogists. In anticipation of this bounty and the chaos that may accompany it, those members of the ISOOG group who maintain this tree who were able to gather in Houston on Saturday planned for this event. 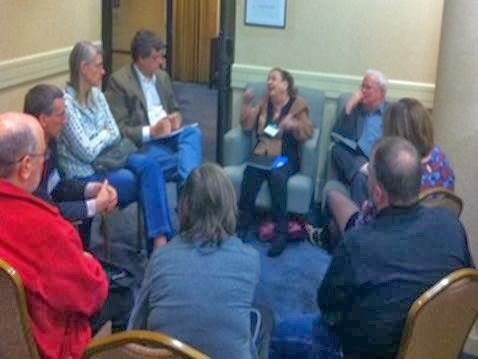 It is clear that our processes need to be reorganized and streamlined if we are going to be able to continue to serve the genetic genealogy community and researchers in related disciplines in a timely basis. I’m going to report on a few of the highlights of Family Tree DNA’s 9th International Conference on Genetic Genealogy which I attended in Houston this past weekend. In this post I will discuss a completely new Big Y test and FTDNA’s holiday sale. Other highlights will have to wait for another day. The big Y test has been a long time in the making. 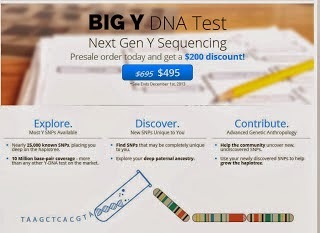 Back in June I had asked FTDNA’s CEO Bennett Greenspan if he had any advice for anyone thinking about ordering an “Early Bird Special of $1,250.00 USD” from FullGenomes new complete Y-chromosome test that was then just beginning to accept orders at $1250 a pop. Bennett responded in part that I could not blog about it but it might be wise to wait until he made a new product announcement in the near future that might be more cost effective. Saturday he made that announcement. You may not notice in the fine print of the picture that this new test is discounted 25% from now until the end of November. The test is definitely not for everybody. Even at the discounted price it still costs $495. You can subtract another $10 off the price if you upload a GEDCOM file to your FTDNA page and copy the code you receive into your order page. Like any genealogy test you should only take this test with malice of forethought. ONLY ONE or at most two men who are closely related should take this test on behalf of other family members. You should consider pooling your money and sponsoring one person to take the test. The new test is called the Big Y. Orders are now being accepted from existing customers only. You must be logged on to your FTDNA account to see the information about the test. For those of you that are somewhat familiar with Y-DNA testing, the values you are used to seeing on the 12, 25, 37, 67 & 111 marker tests are for short tandem repeats (STRs). Some of these values change every several generations so they are good for genealogists because they generally separate relatives from those with whom you are not closely related. The new test is targeted to identify single nucleoid polymorphisms (SNPs). Our entire human instruction manual is written in our cells using a 4 letter alphabet which is reported to us at any given location as A, G, C or T. In the double helix of DNA mutations cause an A & G or a C & T to trade places. SNP mutations are generally a permanent change. The history of our ancestors' journey from the dawn of time is recorded in our cells. It gives us another tool that MAY help us demolish genealogical brick walls that have stymied our research. At least for now we are not using this tool to match will others. That may come later. Rather we are trying to refine the path from our ancient clans down into genealogical time--since most of us have had surnames). In this quest some of us will be successful and some of us will not. In my own case I can thoroughly document my 6th great-grandfather Philip Dowell who died in 1733. Enough of his current descendants have tested that we know what his exact 111 Y-chromosome markers were. But this still has not given us any real clues about where he and his ancestors were before he showed up as an established tobacco planter in Southern Maryland in the 1690s. His haplotype, as far as we have been able to break it down is very common in the British Isle--and to a lesser extent in other parts of Western Europe. I am hoping that this Big Y test will help refine this much further. I don't realistically expect that it will narrow down his origins to something as specific as one of today's zip codes. However, any clues would be appreciated after looking for his origins for almost half a century. I'm also having the DNA of my father-in-law tested. His great-grandfather came from somewhere in Ireland to Chicago in the 1850s. He died in 1864 at the young age of 34 when his son was only 4. What few traces he may have left were largely destroyed in the 1871 Chicago Fire. To date he also has no close DNA matches that would help us pin down where in that island we should be looking for his point of departure. This Big Y test may not be for you. However, if it is something that might help your research, it would be beneficial to act BEFORE THE END OF NOVEMBER. 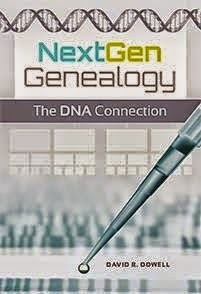 Of course if you are not yet an FTDNA customer you are not eligible to for the introductory price. However, FTDNA is offering a wide array of other tests at sale prices that will be available until the end of December. If you are trying to think of a present for a friend or family member who has everything, consider these possibilities: an initial test, an upgrade of an existing test, and two different tests in combination. If you are not sure where to begin testing or what a particular test might tell you, feel free to email me: InfoDoc [at] DDowell [dot] com or post a question in the comment box below. In my next post I will describe one of the interesting scientific questions that was raised at the conference. Do not get the steps out of order! Take a random sample of approximately 3 billion bases of DNA that broadly represent each of the 23 chromosomes from the nucleus of a cell of a female of the species. Take a random sample of approximately the same number of bases of DNA that broadly represent each of the first 22 chromosomes from the nucleus of a cell of a male of the species. b. Add an X-chromosome intact from the male to create a girl. Add mitochondria from the female to energize the new organism. Incubate in a warm womb for nine months. Warning: The next 18 years will be the roughest.